Celebrate Father's Day in 'Swiss Style' with Raymond Weil. 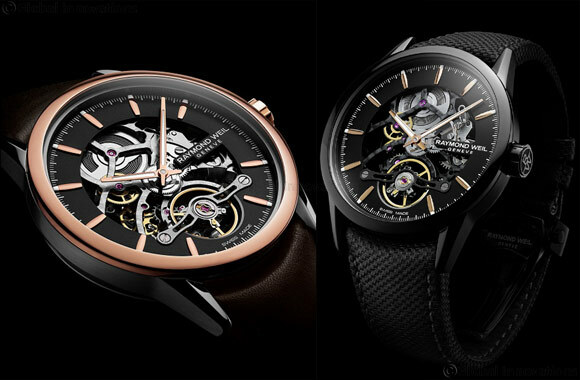 May 16, 2018 - Dubai, UAE: After launching its first in-house movement, born from the long term collaboration with Swiss movement manufacturer Sellita in 2017, RAYMOND WEIL unveils the new and exclusive CALIBRE RW1212 Skeleton as a sign of its desire to keep pushing boundaries. In 2018, RAYMOND WEIL continues on its innovation pathway by developing the in-house designed movement. The new stylish skeleton Calibre RW1212 is proof of the ever-evolving achievements to these in-house movements. RAYMOND WEIL introduces this bold and distinctive model featuring an open-worked dial, revealing most of the sophisticated movement with an intricate perlage finish. The distinctive characteristic remains the 6 o’clock front dial positioning of its visible balance wheel. The dial, however, has been opened, exposing the manufacturing beauty and highlighting the richness of watchmaking expertise, whilst infusing it with its distinctive free-spirited attitude. The freelancer Calibre RW1212 Skeleton is a two hand model providing an understated display of the hours and minutes. While working on the initial design of the Calibre RW1212, the R&D team at RAYMOND WEIL redesigned and pared down all the elements closely relating to the exquisite mechanism so as to endow this exclusive in-house movement with even more depth and character. Framed by a 42mm steel case, the movement’s assembly and open-worked details are key to the final horological aesthetic of this timepiece. The mechanical self-winding Calibre RW1212 beats at a frequency of 28,800 vibrations per hour and has a 38-hour power reserve. Its RAYMOND WEIL engraved oscillating weight has been skeletonized to increase the transparency of the timepiece.